With the district races behind them, the focus is now on the UIL Region 1 Cross County Championship at Mae Simmons Park in Lubbock on Monday. 1. Franklin: The Cougars earned its first District 1-6A championship since 2005. Sophomore Eva Jess defended her individual title winning in 18:39.37. The Cougars had four runners in the top 10 and finished with 34 points. Other top 10 runners were senior Amalia Dorion (fourth, 20:24.29), freshman Jenna Saunders (seventh, 20:51.92) and junior Lorien Clark (tenth, 21:20.19). The team will advance to the Region 1-6A Meet in Lubbock on Monday. 2. Eastwood: The Troopers won its 11th district title in 13 years, easily winning the District 2-5A championship with 32 points. Freshman Lauren Wells won the individual title in 19:23.73. Eastwood placed four runners in the top 10 – Walls and juniors Meadow Ortiz (fifth, 20:34.94), Destiny Martinez (sixth, 20:34.94), Eileen McLain (10th, 21:16.56). The team will race at the Region 1-5A Meet in Lubbock on Monday. 3. Americas: The Trailblazers finished second at the Distirict 1-6A Championship with 61 points. Three Americas runners finished in the top 10 – junior Daphne Duran (third, 19:57.28), junior Priscilla Villalobos (eighth, 21:10.32) and sophomore Lauren Anderson (tenth, 21:17.33). The team will advance to the Region 1-6A Meet in Lubbock on Monday. 4. Jefferson: The Foxes move up a spot after its impressive District 1-5A championship. Jefferson placed five runners – individual champion Crystal Peterson (first, 19:44.80), Monique Correa (second, 20:44.56), Melody Tsutsumi (fourth, 20:54.08), Ivette Rojas (seventh, 21:17.93) and Saxon Alvarez (tenth, 21:36.13) – good for 20 points. The team will advance to the Region 1-5A Meet in Lubbock on Monday. 5. Eastlake: Eastlake was second in the District 2-5A championship with 58 points. Senior Aeriel Garcia was second overall in 19:47.43 while classmate Amaris Chavez was third in 20:15.59. The team will advance to the Region 1-5A Meet in Lubbock on Monday. 6. Coronado: The T-Birds were third with 66 points at the District 1-6A Championship. Senior Jennelle Jaeger-Darakjy was second in 19:07.31 and junior Sophia Flores was sixth in 20:45.45. The team will advance to the Region 1-6A Meet in Lubbock on Monday. 7. Socorro: The Bulldogs placed fourth at the District 1-6A Championship with 91 points. However, junior Jazmin Chacon finished fifth overall in 20:35.30 to qualify for the Region 1-6A Meet in Lubbock on Monday. 8. Canutillo: The Eagles picked a good day to run its best team race of the season and placed second at the District 1-5A Championship. The team scored 81 points and will advance to the Region 1-5A Meet in Lubbock on Monday. Its top two runners were juniors Ivy Lara (14th, 22:25.35 and Yulisa Ortega (15th, 22:29.26). 9. San Elizario:The Eagles move up a spot after winning the District 1-4A Championship. 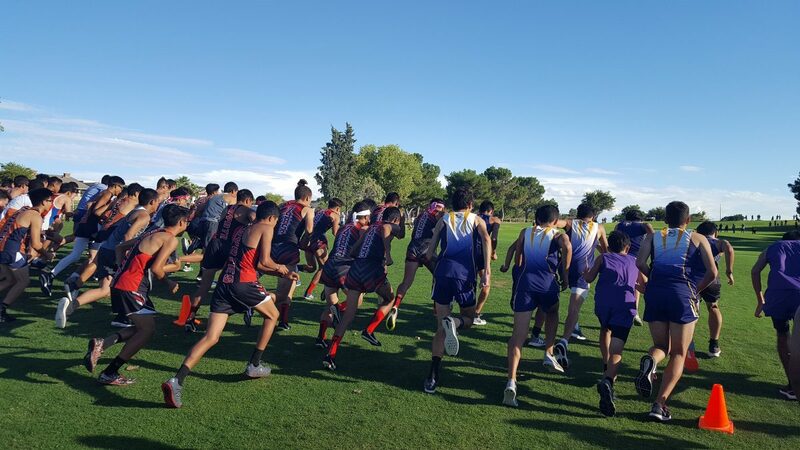 San Elizario and Clint finished with an identical 36 points but the Eagles won the title based on its sixth runner junior Giselle Acevedo who finished 14th, three spots ahead of Clint’s sixth runner sophomore Leilani Navarrete. The team will advance to the Region 1-4A Meet in Lubbock on Monday. 10. Horizon: Horizon placed third at the District 2-5A Championship with 99 points and will advance to the Region 1-5A Meet. Senior Kenia Enriquez was fourth in 20:31.26 while junior Destiny Beltran was seventh in 21:02.05. Dropped out: Bel Air, Montwod. Austin sophomore Mora Montes was third at the District 1-5A Championship. She will compete at the Region 1-5A XC Meet in Lubbock on Monday. 8, Daphne Duran, Americas, 18:48.63 (McNeil Invitational, 9/29). 9, Lauren Walls, Eastwood, 19:02.5 (Woodbridge Classic, 9/25). 10, Mariana Guzman, Americas, 19:06.79 (Race to Midnight, SAC, 8/17). Andress sophomore Caryn Hart was ninth at Friday’s morning’s District 1-5A Championship and earned herself a trip to regionals. 1, Eva Jess, Franklin, 82 (7). 2, Jennelle Jaeger-Darakjy, Coronado, 73 (2). 3, Aeriel Garcia, Eastlake, 63 (2). 5, Skyler Goodman, Chapin, 48. 8, Angeline Lujan, Parkland, 32 (2). 9, Morayma Montes, Austin, 29. 10, Sophia Flores, Coronado, 28. Lauren Walls, Eastwood, 25 (1). Crystal Peterson, Jefferson, 18 (1).